In 1986, the U.S. federal government created the Low-Income Housing Tax Credit (LIHTC) program as an indirect subsidy to encourage private investment in affordable housing. Since then, LIHTC properties have provided numerous opportunities for investors as they can often outperform traditional multifamily assets when it comes to investment returns. They maintain consistently high levels of occupancy and a foreclosure rate of less than 1.0 percent. Furthermore, participation often allows banks to meet Community Reinvestment Act (CRA) requirements. The LIHTC program is designed to subsidize either 30 percent or 70 percent of development costs. An applicant can apply for a 4.0 percent credit that offsets 30 percent of the development cost or for a 9.0 percent credit that will subsidize 70 percent of the cost. Although they are called 4.0 percent and 9.0 percent credits, actual rates are published monthly and merely approximate 4.0 or 9.0 percent. The U.S. Department of the Treasury uses a formula to set the rates using current market rates. This causes LIHTC rates to fluctuate over time. The appeal of LIHTC properties for investors lies in the tax breaks they offer. Because landlords are not free to raise rents in the same fashion as with other multifamily properties, many LIHTC properties operate with thin profit margins. Instead of receiving cash flow from rent, an investor will directly subsidize the development cost of the property and in return receive income tax credits for 10 years. The investor will agree to the LIHTC investment as long as the present value of the tax benefits exceeds the initial investment. Suppose an LIHTC property under development has an eligible basis—the total direct development cost eligible to receive the credit—of $1 million. An investor considering investing in the property requires a rate of return (IRR) of 4.25 percent. If all the units in the property are for low-income families, making for a 100 percent “applicable fraction” and the developer applied for the 4.0 percent credit to fund the property, the following table shows how the tax credit amount is calculated. In this case, the investor values the 4.0 percent credits at $320,435. He/she will then buy the credits from the developer at a price of $0.80 per credit ($320,435/$400,000). Prices per credit are generally determined by the overall investment market. Many investments are priced using IRR, and each investor may have a different acceptable rate of return guided by the market environment, specific investment characteristics and cost of capital. Note in the example above the 4.0 percent LIHTC credit rate is unrelated to the IRR. The investor also receives other benefits. Depreciation and project deductions can be claimed by the investor against other income. Additionally, the property may receive tenant-based Section 8 benefits via the local public housing authority that allow the landlord to charge a higher rent than the acceptable LIHTC rent (known as the Section 8 overhang), generating additional cash flow. As always, there remains an element of risk. The primary risk to the investor is the recapture of credits due to the project falling “out of compliance.” States monitor projects to ensure they meet income and eligibility requirements, and owners of LIHTC properties are required to document tenants’ eligibility and report property compliance at least annually. Even though the credits are generated for 10 years, the property must remain in compliance for 15 years, requiring considerable due diligence on the part of investors. The market fundamentals for the affordable housing sector are healthy. 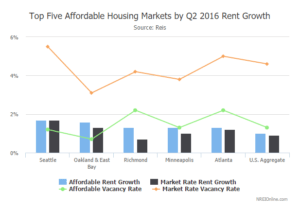 In the second quarter of 2016, the average affordable housing market rent for the 45 markets tracked by Reis was $849 per unit, a 1.0 percent increase from the previous quarter. The vacancy rate was 1.3 percent, down from 1.4 percent in the first quarter. This compares to a vacancy rate of 4.5 percent for multifamily (market-rate) properties. Of the 45 affordable housing markets, 38 posted a vacancy decline in the second quarter. As seen in the chart below, rent growth for the affordable housing market was higher than for the corresponding multifamily market for the top five metros. This is not surprising, given the lower rent base for affordable housing. However, the chart also shows how the gap between the two rents varies widely by city. This is surprising and says more about the cities than it does about affordable housing. For the next few years, the affordable vacancy rate is expected to remain flat while the multifamily vacancy rate is expected to drift upwards due to the high level of construction underway. Reis expects affordable housing demand to exceed supply for 2016, but for supply to exceed demand for the ensuing few years. Similar to the multifamily sector, our forecast shows a slowdown in annual rent growth over the next few years. The LIHTC market is a unique sector, with significant opportunities for investors. It accounts for about 90 percent of all affordable housing built in the United States. The demand for LIHTC funding from investors remains strong as rising housing costs prevent many families from either buying a home or affording market-rate rentals. The affordable housing sector should remain profitable for both developers and investors for years to come.